There is no end. A new beginning starts today: "Joystiq X Engadget" is the temporary name for a long-term home. A new place to laugh along with us on Twitch streams; a new place to commiserate when all the games are broken; a new place to celebrate when an unexpected jewel shines through the din of hype. A new place, yes, but a new place full of familiar faces. Hi, I'm Ben Gilbert, and I used to work at Joystiq. Maybe you heard me on the Joystiq Podcast, or read my work on the site? It's been a few years, but I've been heading up gaming coverage at Engadget in the meantime. To my virtual left is Joystiq senior reporter Jess Conditt, who's joining me at the helm of this new venture. We are the continuation of Joystiq -- its new beginning -- if not in name, certainly in spirit and drive. So, what in the hell is "Joystiq X Engadget," other than a kind of hard name to say? It's the new home we're creating on Engadget dedicated solely to gaming coverage. Not game coverage, but gaming coverage -- that's an important distinction. We are not in the business of providing press release regurgitations, trailer-based marketing for big-budget games or previews based on carefully scripted PR events. That's game coverage for the most part. Gaming coverage should aim to cover the intersection of life and games: how the medium impacts us as human beings. Wait, that sounds dreadfully serious, and I'm basically a human Muppet. 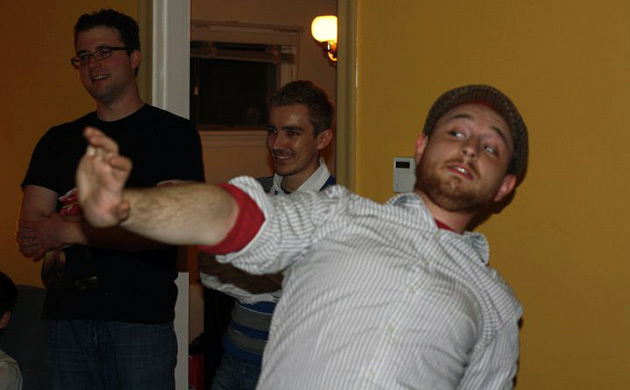 Let's try this again with an anecdote from my favorite times with the Joystiq crew. Each year at PAX East, Boston-based Alexander Sliwinski hosted "family dinner." He'd have the whole staff over to his house the night before the show, order a bunch of delicious Italian food and we'd play games as a group of friends. Smash Bros., Rock Band, Dance Central -- whatever it was, we were all thrilled to be in the same place long enough to enjoy each other's company and actually play some damn games. That's why we're doing this in the first place, right? Despite all the life- and career-shaping moments I shared with colleagues there, my fondest memories are the simplest: playing games with good friends. Gaming isn't release dates or press conferences -- it's exploration and discovery, joy and sadness, challenges overcome. It's demonstrating to respected colleagues that your obsession with Smash Bros. runs deeper than they could possibly imagine. It's the medium I grew up with, that I love, that I believe is more impactful than it's given credit for. So, yes, the goal at Joystiq X Engadget is to cover the intersection of life and games. It sounds serious because we take it seriously, but we're also the same goofy dorks you've laughed alongside for years at Joystiq. There is no end, right? Our website, you'll notice, has a massive Twitch player embedded right at the top. That is, of course, intentional: Beyond the standard Tuesday and Thursday streams you've come to know and love, we've got big plans to expand video dramatically. Our Twitch audience has grown tremendously in the last year, and it's the top priority going forward. That's to say you are the top priority going forward -- we want to engage with readers directly over this medium we all love so much. Twitch empowers us to do just that. Already following Joystiq's Twitch channel? Good news: That will remain the spot for all our livestreams. And what of those big plans? Check back in March as we add our first Twitch show. We'll be sharing more details in the coming weeks, but in the meantime, please let us know in the comments/on Twitter/via carrier pigeon what you want to see. We want your ideas for future additions! The other major addition to our gaming coverage on Joystiq X Engadget is reviews: Yes, we'll continue to run game reviews in some form on the new site. Continuing with Joystiq's recent move, game reviews won't be scored. We won't review everything, and we're not writing thousands of words. Frankly, we want to tell you if it's worth your time -- the most precious commodity -- and get back to talking about how you are playing it. And what of news, and features, and everything else? Jess isn't joining Engadget just for fun! She's bringing the great work she does at Joystiq to Engadget. Our first project is coming soon: serial-style pieces digging into huge topics. We're also porting the Joystiq archives over to Engadget, so none of the 10-plus years of work archived therein will be lost to the wiles of the internet. In the meantime, Joystiq.com will remain online as a living archive -- Dead Space Girl is still in there, screaming her face off. Joystiq X Engadget is the future of Joystiq and the expansion of Engadget's gaming coverage. The media term for this is a new gaming "vertical" within Engadget, but media terms like "vertical" and "content" are hollow when you're talking about a respected institution built by passionate, living beings over the course of a decade. I love Joystiq; I'm from Joystiq; and this is where Jess and I are taking Joystiq. There is no end -- just a new beginning.